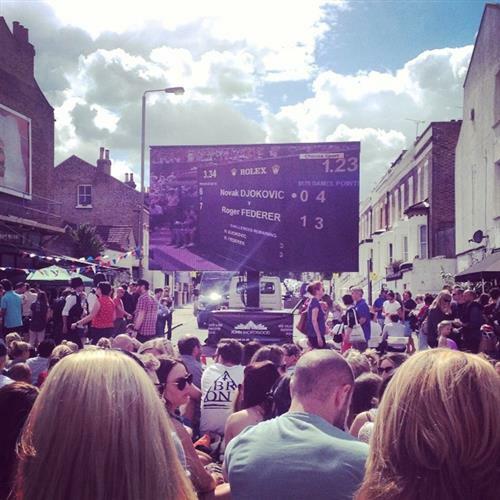 Think everyone wants Federer to win! C'mon Federer!! GAME FEDERER 2-3. Well that was remarkably simple. 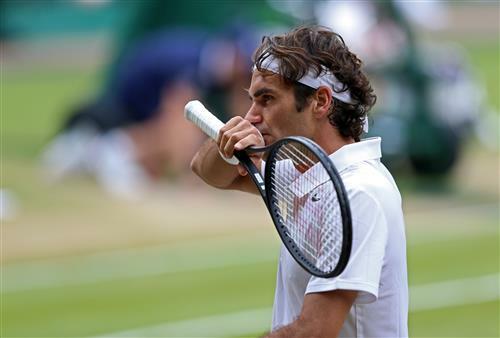 Federer lands another ace to hold to love. His first serve in percentage is 68% compared to 65 for Djokovic. GAME DJOKOVIC 3-3. Federer moves 0-15 in front and he can feel hard done by as his shot in the next point lands just on the baseline but is called out. It is corrected by the umpire but the point is replayed despite Djokovic sending the forehand wayward. Djokovic lands two first serves at 30-30, both of which are returned long and it's a hold. Please tell me how the game is going,its the fist time ever I have missed the Tennis at Wimbledon.because I no longer live in the UK. GAME FEDERER 3-4. Djokovic fails with a lob attempt as Federer smashes it back past him to set the tone for the game. Federer racks up a 13th ace as he moves 40-0 ahead but Djokovic does prolong the game with a brilliant running forehand down the line only for Federer to seal it in the next point. One set all, Edna, and on serve in the third set. This match is heating up nicely.. Come on #Federer !! GAME DJOKOVIC 4-4. It's a hold to love with Djokovic up to 15 forehand winners as he serves out wide and puts into the open court. Tim Henman drives me mad in commentary box. He spoils the game with stupid comments. Who is your favourite of the Wimbledon commentators, Michelle? Boris Becker or Tracy Austen. You? I've quite enjoyed the Americans, Jimmy Connors and John McEnroe. GAME DJOKOVIC 5-5. Federer tries to come into the net but Djokovic has all the answer, finding a brilliant angle with a backhand from the baseline to move 40-0 ahead. He goes long on the next point but seals it shortly afterwards and we are still on serve. Federer moves 30-0 ahead but a vicious backhand from Djokovic on the second serve gets him right back in the game. He misses a simple looking mid-court backhand in the next point and immediately complains to umpire James Keothavong who issues an announcement to the crowd to keep quiet during rallies. Game Federer is the next call from him just seconds later following an ace down the middle but Djokovic successfully challenges and it's into deuce. GAME FEDERER 5-6. Federer saves one break point with a deep serve to catch Djokovic out. Both let our cries, Federer in joy, Djokovic in frustration as the ball seemed to change path slightly following the touch on the line. Another break point comes and goes before Federer brings up game point with an ace out wide taking his match tally to 19. And the 20th is racked up straightaway to take the game and make Djokovic serve to stay in this third set. Wow. 20 aces for Federer. You don't see that often, and we're only in the third set. New racquet for Federer as he looks to break and take the set as Djokovic serves with the new balls. GAME DJOKOVIC 6-6. An outstanding return of serve from Federer matters little as Djokovic claims a second point in succession with a volley at the net. And he secures the hold to send us into a second tie-break. This feels like a massive moment in this final. 2-1. Not a bad way to start a breaker with your fastest serve of the tournament... a 127mph ace down the centre from Federer. But the Serb holds both his service points as well. 3-2. Djokovic takes the mini break with a 12th passing winner of the match compared to just two from Federer. 4-2. Federer returns the second serve long and it's advantage Djokovic at the change of ends. 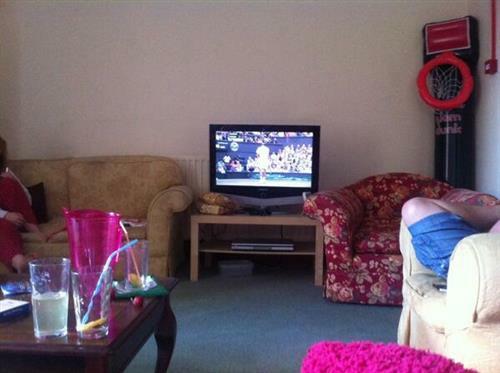 This Djokovic/Federer match is pretty damn good. Djokovic is clearly the master of lob shots. Such beauty from this man. 4-3. A brilliant backhand return of serve but Djokovic stills takes the three point advantage as Federer goes long. Or does he! Federer challenges and it has clipped the back of the line... just. Djokovic wants to replay the point but it's given as a point to Federer. 5-4. Federer sends one immediately long though and Djokovic regains the mini break. SET DJOKOVIC 7-6 (7-4). 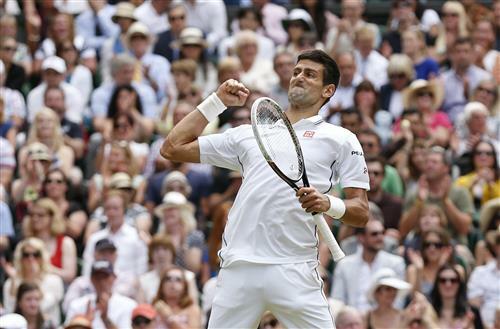 Djokovic just one set away from a second Wimbledon title. Brings up two set points with a booming forehand before Federer sends a backhand wide following good baseline work from Djokovic. Just six unforced errors between the pair there in that last set. Highly impressive. GAME DJOKOVIC 1-0. The perfect start to what the Serb will be hoping is the final set of the match. GAME FEDERER 1-1. Djokovic takes another fall as he looks to retrieve a Federer drop shot but he responds excellently with a forehand winner down the line. Federer brings up two game points though with an ace and then takes it with the unreturnable serve.